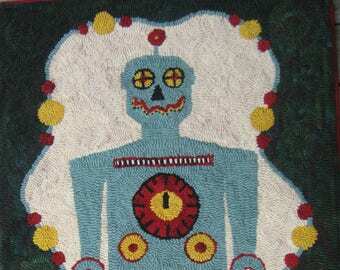 Announcement Hooked rugs, rug hooking and needle punch supplies, and handmade sundries . 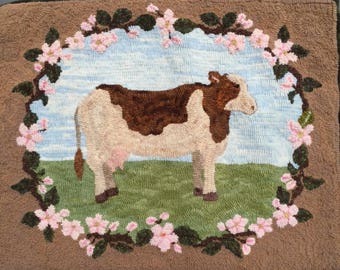 . .
Hooked rugs, rug hooking and needle punch supplies, and handmade sundries . . . Prompt service - excellent quality and design. Fabulous project to learn circles. I love the graphic design of this rug. It is even more impressive in person!!! I received it within a few days of placing the order, which was wonderful!!! Welcome to The Paisley Studio. Rug Hooking has been my passion for over two decades now. I not only make hand-hooked rugs, I make patterns for other rug hookers. I also do a variety of other fiber related handcrafts including, knitting, needle punch,and felting. I'm proud of my work and each piece contains care & expertise. I offer a 7 day satisfaction guarantee, even for gifts. Please contact me within 7 days after your rug or other item is received to let me know whether you love it or if you'll be sending it back along with return postage (buyer is responsible for return postage). Of course, I can only accept items returned to me that are free of odors (cigarette, perfume, pet) and are in saleable condition. Thank you for your understanding. Debit, credit cards, and Etsy Gift Cards. I prefer to ship via USPS Priority mail.